Integrated Pest Management: Do I have Mice? What Do I Do? Cartoon mice and cute pets in a cage notwithstanding, no one wants mice in their house. If you have mice, it means you need to take action to get rid of them, and that can be a real pain in the neck. But mice aren’t just about a few boxes of cereal or a bag of bird seed being broken into by the little furry beasts. They can pose real health dangers that need to be taken seriously. In this week’s article, we’ll walk you through some basics about having mice and getting rid of them. We are Colorado Pest Management, and we are dedicated to solving pest control problems in the most practical and humane ways possible. Droppings, or the excrement, of mice around your home, especially around good sources, is a sure sign that you have mice. It’s important to clean the droppings up when you see them and when you do wear gloves and a face mask. Smudges along baseboards occur when mice, who use the same path over and over again, leave a smudge from their fur rubbing and leaving bits of dirt every time the pass by. If you’ve ever dealt with a mouse infestation of any size the distinct smell of mouse urine will likely have seared itself into your brain. These little critters don’t see well (remember the three blind mice) and use scent to find their way back to their territory. Another sign is hearing mice in your walls. You can hear them scratching and scurrying around, most likely right as you are trying to fall asleep. Another smell that mice leave behind is when one dies in your home. This unforgettable scent is a sure sign that a mouse population calls your house or business home. Mice can get trapped, die of natural causes or from poisons, or from having gotten stuck to a glue trap but not enough to stop it in its tracks, and it can get jammed somewhere and slowly die. access to your home and all its food stores and cozy nesting materials. If you see a whole chewed through some drywall at the back of a kitchen cupboard or near a step, and this hole is about one and a half inches in diameter, it is likely a mouse hole. If the hole is much larger than that, you could be dealing with rats instead of mice. Besides chewing their way into your home, mice leave their mark on cardboard boxes, plastic containers, and anything they chew up to make their nesting material out of. Of course, seeing a mouse shoot across your counter as you flip the light on in your kitchen means you have mice. Mice are not lone wolves. If you see a mouse, you have mice. If you have concluded that you have mice, you’ll want to decide on a course of action. There are a few main prongs of action you can follow. Traps are a great way to start. You can use old-fashioned disposable mouse traps (which you can actually reuse if you dispose of any trapped mice with gloves and reload the trap.) There are also easy-to-use plastic traps that you simply pinch open to release the trapped mouse and then can reload. Glue traps are an option, but mice can walk away with those and die somewhere in your house (see the above smell item.) Some people prefer to not harm the mice and use live traps. This is certainly a humane way of dealing with mice, and if you are committed to capturing and transporting them far away from your house, our hats are off to you. Sure, getting a cat will help you get rid of some mice, but it would take a super cat to completely rid your home or business of a mouse population. If you want a cat anyway, get one, but don’t get one as your primary way of dealing with mice. Many people wonder if it’s okay to leave the mice that live in their garden alone. 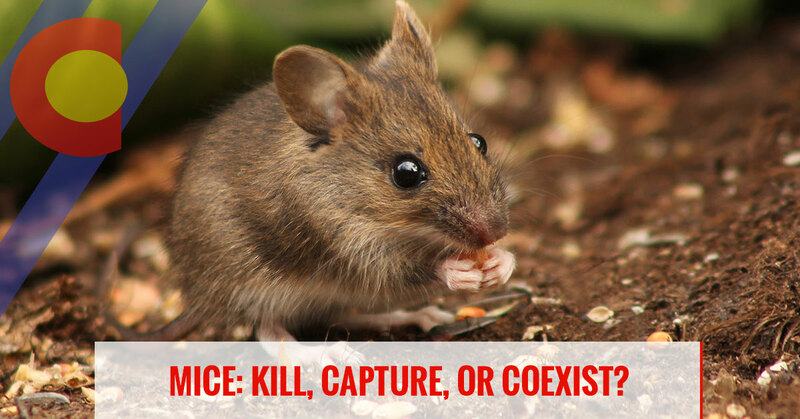 The idyllic notion of co-existing with nature’s creatures is lovely, but when it comes to mice, it’s best to act to control their population, or they’ll be in your house or business very soon. Another reason to control the population of mice is that they pose a serious health risk. One of the most notable diseases that results from contact with infected mouse urine or feces is the Hantavirus family of RNA viruses, which can kill humans. One of the best things you can do, and part of any integrated pest management plan, is mouse-proofing your home. You’ll need to do all you can to eliminate any food sources for them such as cereal boxes, and easily access pet food. Closing access holes around the outside of your house and any interior holes you find is an essential step. Fixing leaks from outside faucets and any interior plumbing leaks is essential to making your home less welcoming to mice or any other pests. Cleaning up any areas that you know mice are frequenting is also important. Use a disinfectant to remove the smell and any germs. Be sure to use a mask and rubber gloves to do this. Doing all these steps can be a big project so, if you need help doing it, don’t hesitate to call Colorado Pest Management and we can come up with a comprehensive plan and carry it out for you. Depending on the size of the mouse population in your home or business, you may need help getting rid of your mice. Especially if you are running a business, you need to take swift and decisive action. Call Integrated Pest Management for professional and non-chemical methods to rid your building of mice.